Provides clean, clear and healthy water conditions and reduces pond maintenance. Effective at reducing fish waste, uneaten fish food, decaying plant matter and excess nutrients that cause algae. Accelerates the decomposition of leaves and other organic matter during the fall and winter months. Will also jump start your pond to a healthier environment in the spring. Specifically designed for large ponds and lakes. These biological treatments create a healthy environment for your pond, breaks down organic sludge and slime, reduces ammonia and nitrite levels and more. Used for generations as an all-natural way to keep pond water clean and clear. Available in a variety of forms- bales, pellets, flakes, and liquid extract. Quickly clears cloudy water. Works by causing suspended particles in pond water to clump together and fall to the pond bottom where they can be vacuumed or removed by filtration. Instantly dechlorinate and detoxify your pond water. Dechlorinators and conditioner will remove and neutralize chlorine, destroy chloramines, and detoxify heavy metals making tap water safe for fish. Kills developing mosquitoes before they become breeding, biting adults. 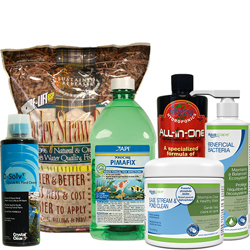 Safe for fish, plants and animals. Eliminate the guesswork and routine of adding water treatments to your pond, fountain, or water feature.The Aquascape Automatic Dosing System accurately and consistently applies your choice of water treatment. Safely colors water a beautiful shades of blue or black. Eliminating UV rays that can lead to unwanted clarity issues while also keeping water temperatures lower. MICROBE-LIFT/Professional Blend Dry packets contain cellulase enzymes, hyper cellulase producing bacteria and a cold weather bacteria (psychrophile) to accelerate the breakdown of leaves, small twigs, sediment and other accumulated dead organic waste. MICROBE-LIFT/Professional Blend Dry can be used as a stand-alone product, combined with our Liquid MICROBE-LIFT/Professional Blend Liquid (PBL) in the spring, or used in winter as well. Cuts costs by eliminating the chance of using excess product. Costs only pennies a day. Easy to use premeasured packets. Dissolves within 5 minutes after placing in water. Unique packet material will keep from sticking together in high humidity.